CARFAX Certified 1 Owner Fully Serviced Quality Certified W/up to 12 Mo / 12, 000 Miles Warranty This Raptor includes: BLACK 6.2L EFI V8 ENGINE (STD) 8 Cylinder Engine Gasoline Fuel NAVIGATION SYSTEM W/IN-DASH SCREEN Steering Wheel Audio Controls HD Radio Navigation System CD Player Auto-Dimming Rearview Mirror AM/FM Stereo Premium Sound System Hard Disk Drive Media Storage MP3 Player 6-SPEED ELECTRONIC AUTOMATIC TRANSMISSION W/OD Transmission Overdrive Switch A/T 6-Speed A/T HOOD GRAPHICS PKG PWR MOONROOF Generic Sun/Moonroof Sun/Moonroof GRAPHICS PKG RAPTOR PLUS PKG Back-Up Camera SVT RAPTOR SERIES ORDER CODE RAPTOR LUXURY PKG Multi-Zone A/C Remote Engine Start Integrated Turn Signal Mirrors Mirror Memory A/C Power Mirror(s) CD Player Climate Control Seat Memory Heated Mirrors Power Passenger Seat AM/FM Stereo Power Driver Seat Heated Front Seat(s) CD Changer Adjustable Pedals Premium Sound System Power Folding Mirrors MP3 Player *Note - For third party subscriptions or services, please contact the dealer for more information. 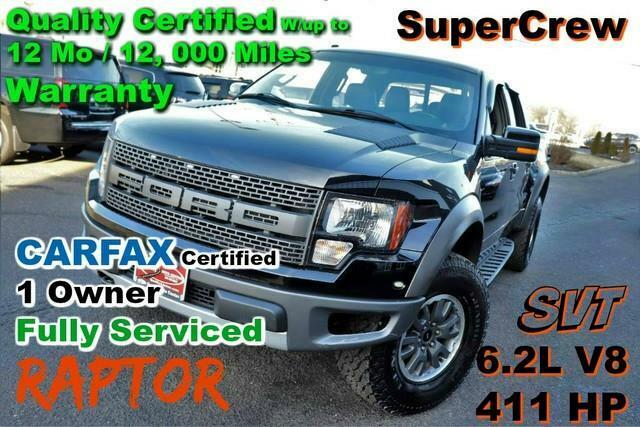 * The CARFAX report for this 2011 Ford F-150 SVT Raptor highlights that it's a One-Owner vehicle, and for good reason. A One-Owner vehicle gives you the feel of owning a new vehicle without paying the new car price. The Ford F-150 SVT Raptor's pristine good looks were combined with the Ford high standard of excellence in order to make this a unique find. Take home this Ford F-150 SVT Raptor, and you will have the power of 4WD. It's a great feature when you need to drive over tricky terrain or through inclement weather. This 2011 Ford F-150 has such low mileage it has been parked more than driven. This Ford F-150 is equipped with navigation, so you no longer have to wonder if you're headed in the right direction. Feel at ease with your purchase of this Ford F-150 SVT Raptor, all records are included allowing you to truly know what you're buying. This Ford F-150 is beautiful and the interior is clean with virtually no flaws. High performance is what this vehicle is all about. You will be reminded of that every time you drive it. Why go with a basic vehicle when you can have it all in this well-optioned Ford F-150? Added comfort with contemporary style is the leather interior to heighten the quality and craftsmanship for the Ford F-150 New tires are just one more reason this vehicle is a great deal. Finding a pre-owned vehicle with flawless paint is a rare find, but you've done just that. The paint on this Ford F-150 SVT Raptor is flawless no scratches, no blemishes, no need to spend extra money on touch ups. Unique and nearly impossible to find, this 2011 Ford F-150 SVT Raptor is a collector's dream come true. Equipped with upgraded wheels, this Ford F-150 is stunning to see driving down the street. More information about the 2011 Ford F-150: Ford claims class-leading fuel economy, as well as best-in-class towing and horsepower for both its base V6 engine as well as both of the available V8s. Ford also says that it's the only automaker to offer a 6-speed automatic transmission across its entire model lineup. The F-150 is also the only full-size pickup so far to offer electric power steering, which saves fuel and gives an improved steering feel. Across the lineup, the F-150 carries through with the full redesign that the truck received for 2009 since then, the F-150's very purposeful, upright instrument panel and vastly upgraded interior materials have stood out in this very competitive class. This model sets itself apart with wide range of models for all budgets, tastes, and needs, available luxury features, Smooth, strong new powertrain lineup, class-leading towing and payload capacities, and fuel efficiency No Credit / Bad Credit / No Paystubs, No problem !! ! All Approved ! Everyone drives ! CLEAN, GORGEOUS, LOW MILES, SHOWROOM CONDITION. CALL NOW QUALITY CERTIFIED up to 10 YEARS 100,000 MILE WARRANTY , To Certify a vehicle, there will be an additional cost for Certification. CALL NOW For details. STUNNING AGGRESSIVE LOOK ON THIS BEAUTIFUL--Call today to schedule a test drive... Good Credit/Bad Credit/No problem!!!! Get paid cash? No problem!! 100% Credit Approval with interest rates starting at 2.49% for qualified customers, our rates will not be beaten. We price our cars at wholesale price to guarantee the best deals for our customers. Our inventory moves quick, please call to confirm the availability of the vehicle of your interest Springfield location 973-564-0112. This vehicle is located at our SPRINGFIELD location. Come visit our new showroom in Springfield NJ. Quality Auto Center has a wide selection of exceptional pre-owned vehicles to choose from, including this 2011 Ford F-150. Opulent refinements married with exceptional engineering make this the kind of car you'll want to own for a lifetime. Handle any terrain with ease thanks to this grippy 4WD. Whether you're on a slick pavement or exploring the back country, you'll be able to do it with confidence. Low, low mileage coupled with an exacting maintenance program make this vehicle a rare find. More information about the 2011 Ford F-150: Ford claims class-leading fuel economy, as well as best-in-class towing and horsepower for both its base V6 engine as well as both of the available V8s. Ford also says that it's the only automaker to offer a 6-speed automatic transmission across its entire model lineup. The F-150 is also the only full-size pickup so far to offer electric power steering, which saves fuel and gives an improved steering feel. Across the lineup, the F-150 carries through with the full redesign that the truck received for 2009 since then, the F-150's very purposeful, upright instrument panel and vastly upgraded interior materials have stood out in this very competitive class. This model sets itself apart with wide range of models for all budgets, tastes, and needs, available luxury features, Smooth, strong new powertrain lineup, class-leading towing and payload capacities, and fuel efficiency No Credit / Bad Credit / No Paystubs, No problem !! ! All Approved ! Everyone drives ! CLEAN, GORGEOUS, LOW MILES, SHOWROOM CONDITION. CALL NOW QUALITY CERTIFIED up to 10 YEARS 100,000 MILE WARRANTY , To Certify a vehicle, there will be an additional cost for Certification. CALL NOW For details. STUNNING AGGRESSIVE LOOK ON THIS BEAUTIFUL--Call today to schedule a test drive... Good Credit/Bad Credit/No problem!!!! Get paid cash? No problem!! 100% Credit Approval with interest rates starting at 2.49% for qualified customers, our rates will not be beaten. We price our cars at wholesale price to guarantee the best deals for our customers. Our inventory moves quick, please call to confirm the availability of the vehicle of your interest Springfield location 973-564-0112. This vehicle is located at our SPRINGFIELD location. Come visit our new showroom in Springfield NJ.